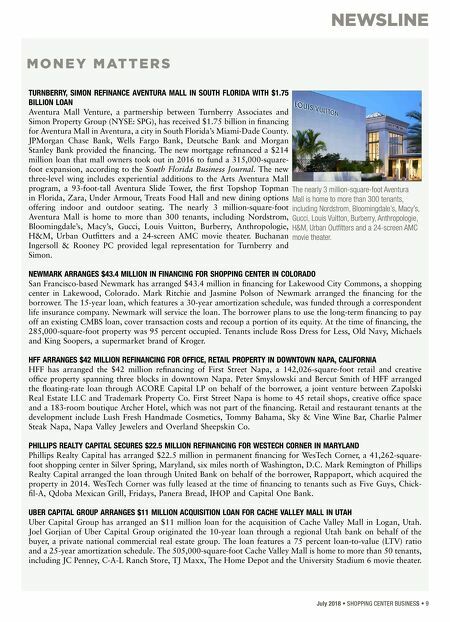 NEWSLINE July 2018 • SHOPPING CENTER BUSINESS • 9 M O N E Y M AT T E R S TURNBERRY, SIMON REFINANCE AVENTURA MALL IN SOUTH FLORIDA WITH $1.75 BILLION LOAN Aventura Mall Venture, a partnership between Turnberry Associates and Simon Property Group (NYSE: SPG), has received $1.75 billion in financing for Aventura Mall in Aventura, a city in South Florida's Miami-Dade County. JPMorgan Chase Bank, Wells Fargo Bank, Deutsche Bank and Morgan Stanley Bank provided the financing. The new mortgage refinanced a $214 million loan that mall owners took out in 2016 to fund a 315,000-square- foot expansion, according to the South Florida Business Journal. The new three-level wing includes experiential additions to the Arts Aventura Mall program, a 93-foot-tall Aventura Slide Tower, the first Topshop Topman in Florida, Zara, Under Armour, Treats Food Hall and new dining options offering indoor and outdoor seating. The nearly 3 million-square-foot Aventura Mall is home to more than 300 tenants, including Nordstrom, Bloomingdale's, Macy's, Gucci, Louis Vuitton, Burberry, Anthropologie, H&M, Urban Outfitters and a 24-screen AMC movie theater. Buchanan Ingersoll & Rooney PC provided legal representation for Turnberry and Simon. 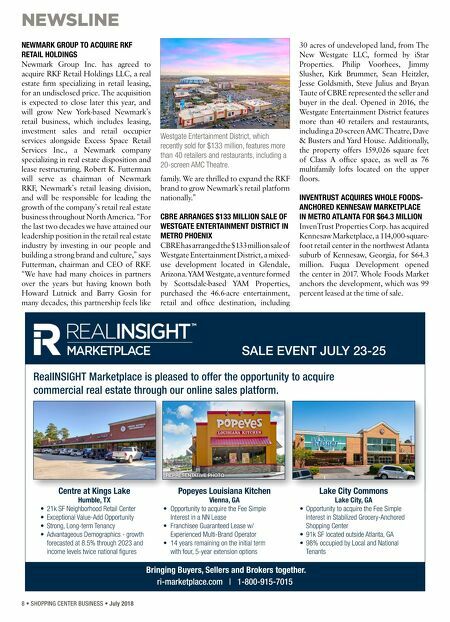 NEWMARK ARRANGES $43.4 MILLION IN FINANCING FOR SHOPPING CENTER IN COLORADO San Francisco-based Newmark has arranged $43.4 million in financing for Lakewood City Commons, a shopping center in Lakewood, Colorado. Mark Ritchie and Jasmine Polson of Newmark arranged the financing for the borrower. The 15-year loan, which features a 30-year amortization schedule, was funded through a correspondent life insurance company. Newmark will service the loan. The borrower plans to use the long-term financing to pay off an existing CMBS loan, cover transaction costs and recoup a portion of its equity. At the time of financing, the 285,000-square-foot property was 95 percent occupied. Tenants include Ross Dress for Less, Old Navy, Michaels and King Soopers, a supermarket brand of Kroger. HFF ARRANGES $42 MILLION REFINANCING FOR OFFICE, RETAIL PROPERTY IN DOWNTOWN NAPA, CALIFORNIA HFF has arranged the $42 million refinancing of First Street Napa, a 142,026-square-foot retail and creative office property spanning three blocks in downtown Napa. Peter Smyslowski and Bercut Smith of HFF arranged the floating-rate loan through ACORE Capital LP on behalf of the borrower, a joint venture between Zapolski Real Estate LLC and Trademark Property Co. First Street Napa is home to 45 retail shops, creative office space and a 183-room boutique Archer Hotel, which was not part of the financing. Retail and restaurant tenants at the development include Lush Fresh Handmade Cosmetics, Tommy Bahama, Sky & Vine Wine Bar, Charlie Palmer Steak Napa, Napa Valley Jewelers and Overland Sheepskin Co. PHILLIPS REALTY CAPITAL SECURES $22.5 MILLION REFINANCING FOR WESTECH CORNER IN MARYLAND Phillips Realty Capital has arranged $22.5 million in permanent financing for WesTech Corner, a 41,262-square- foot shopping center in Silver Spring, Maryland, six miles north of Washington, D.C. Mark Remington of Phillips Realty Capital arranged the loan through United Bank on behalf of the borrower, Rappaport, which acquired the property in 2014. WesTech Corner was fully leased at the time of financing to tenants such as Five Guys, Chick- fil-A, Qdoba Mexican Grill, Fridays, Panera Bread, IHOP and Capital One Bank. UBER CAPITAL GROUP ARRANGES $11 MILLION ACQUISITION LOAN FOR CACHE VALLEY MALL IN UTAH Uber Capital Group has arranged an $11 million loan for the acquisition of Cache Valley Mall in Logan, Utah. Joel Gorjian of Uber Capital Group originated the 10-year loan through a regional Utah bank on behalf of the buyer, a private national commercial real estate group. The loan features a 75 percent loan-to-value (LTV) ratio and a 25-year amortization schedule. The 505,000-square-foot Cache Valley Mall is home to more than 50 tenants, including JC Penney, C-A-L Ranch Store, TJ Maxx, The Home Depot and the University Stadium 6 movie theater. The nearly 3 million-square-foot Aventura Mall is home to more than 300 tenants, including Nordstrom, Bloomingdale's, Macy's, Gucci, Louis Vuitton, Burberry, Anthropologie, H&M, Urban Outfitters and a 24-screen AMC movie theater.